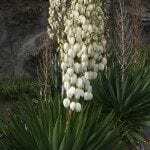 The Yucca is between 5 to 6 ft in a large pot. A word of caution, though. If the rot has extended to the branches, so that they are soft, there's probably nothing you can do to save the plant. Try again with another one, and let the soil dry between waterings until it is only slightly damp; test the soil near the bottom of the pot to determine the moisture level; and keep the yucca in high light.